We venture to the Phoenix stop of the Vans Warped Tour to talk with bands and fans about their views related to UFOs and intelligent extraterrestrial life. We also discuss a collaboration between UK astronomers to search for extraterrestrials. 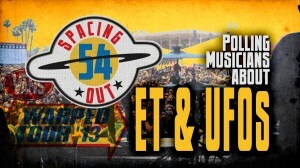 That and other space and UFO news on this episode of Spacing Out! It looks like Maureen has turned mean; what happened??? She is the meanest person ever. She beats me and makes me cry as soon as the cameras are off. Hey Jason, why don’t you go cry about it, you big baby! loved the band and fan polling. it was a great idea!